This eight-real coin comes from Potosí, Bolivia. Coins of this denomination were also known as silver pesos, or “pieces of eight,” and were a standard monetary unit in Spanish America, Europe and even Asia. Two sides of a single coin are shown in this photograph, with obverse at left and reverse at right, rotated 45 degrees to show the imagery upright. 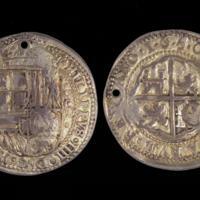 Originally silver, the coin may have been gilded to enhance its value as ornament. The drill hole suggests it was once worn as jewelry. 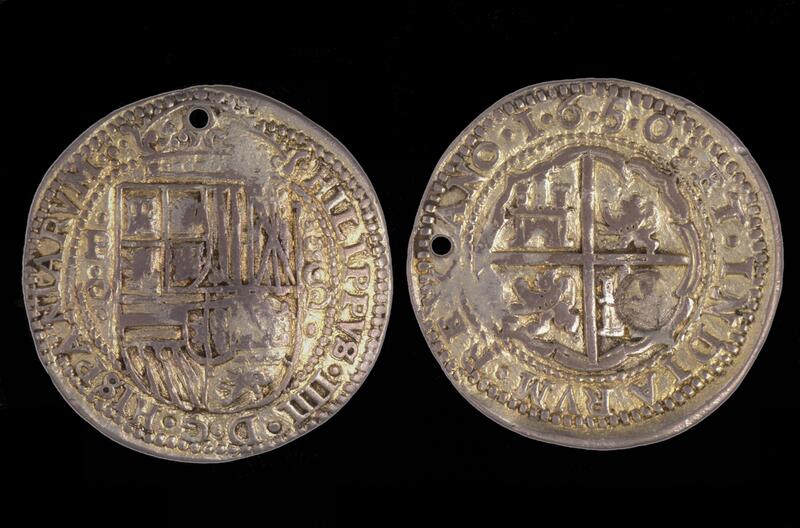 Philip IV’s name appears on the obverse, as does the Habsburg shield. The “P” to the right of the shield identifies the coin as having been made in Potosí’s mint. The shield of Castile and León appears on the reverse, a standard feature of all Spanish American minted coins. Pressed into the lower castle, a round countermark is visible. The Republic of Central America may have added it to the coin after the wars of Independence. Lacking a mint of its own, its government recycled coins of the earlier empire. In an age when precious metals were the currency, Spanish coins were valued internationally because of the exceptional purity of their silver. This was no accident, but the result of careful policing of the royal mints in Mexico City, Lima, Santo Domingo, Potosí and eventually Bogotá. When the alcalde of Potosí, Francisco Gómez de la Rocha, and the chief assayer, Alonso de Tapia, were caught minting coins of impure silver in 1648, they were publicly executed in the main plaza of Potosí, just a few yards from where this coin would be made two years later. Coins like this one, sometimes called “cob coins” were made by hammering hot discs of silver against a die. This particular coin is called a “royal” as it was more carefully made than most cob coins. While it is worth the same by weight as other eight-real coinage, it may have been used for symbolically important payments, like donations to the church. This coin was minted of silver taken from Potosí’s Cerro Rico, stamped in that city’s Casa de la Moneda, packed on a mule and taken to a coastal port, to be shipped in a galleon across either the Atlantic or the Pacific. Used widely in China and the Philippines, silver coins like this one, with their carefully standardized values, allowed intercontinental trade to flourish. In Europe, they helped fuel the Spanish crown’s aspirations by funding its military campaigns. The names, and sometimes portraits, of reigning monarchs appear on coins, thus associating fiscal stability with the reigning monarch himself. Lane, Kris. 2015. "Corrupción y Dominación Colonial: El Gran Fraude a la Casa de la Moneda de Potosí en 1649." Boletín del Instituto de Historia Argentina y Americana Dr. Emilio Ravignani 43: 94-130. Lane, Kris. "From Corrupt to Criminal: Reflections on the Great Potosí Ming Fraud of 1649." In Corruption in the Iberian Empires: Greed, Custom, and Colonial Networks, ed. Christoph Rosenmüller. Albuquerque: University of New Mexico Press, 33-62. Paoletti, Emilio. 1999. Monedas Macuquinas de 8 Reales de Potosí. Buenos Aires.